Back Wynd Taxi rank in Aberdeen. Your views: Should all taxis be wheelchair accessible? 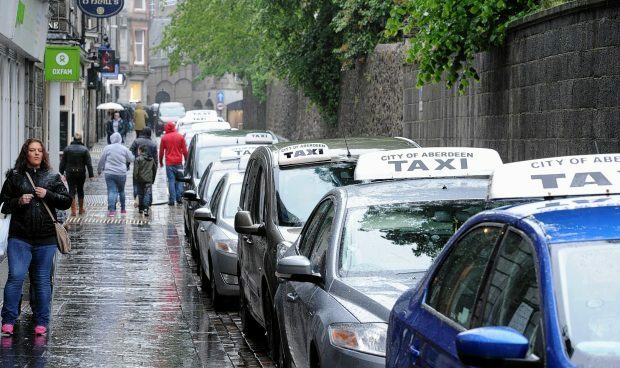 Aberdeen taxi drivers have branded plans to make every cab in the city wheelchair accessible “utter madness”. Drivers currently operating wheelchair accessible vehicles have also claimed they would make more money driving a saloon taxi because the public actively avoid the disability friendly vehicles. One driver who uses a wheelchair accessible taxi and wished to remain anonymous, said: “I’ve been in the job for 16 years, for a year I had a saloon and in that time I had more work than ever. “I can’t take my mother in my wheelchair accessible taxi because she had a knee replacement, the taxi is too high and she can’t lift her leg to get in. Ken Watson, who operates a saloon taxi echoed these sentiments. He said: “A lot of people walk past the wheelchair accessible vehicles and come to a saloon. “A lot of customers say to me that they prefer a saloon car. Although Marc Anderson, who drives a wheelchair accessible taxi disagrees. He said: “I don’t think if I had a saloon I would get more trade. “The wheelchair accessible vehicles are easiest for everyone to get in and out of. “Whether you are disabled, able bodied, drunk or sober you are able to get in and out of this vehicle easily.